The world of cruelty free and vegan beauty has come a long way in the last few years and I’ve been lucky to try out some amazing products that will be perfect to fit into your Spring beauty regime. From various brands, all of these products stand out for me with premium ingredients and high quality results that leave the products desireable to use and a pleasure to place on my skin. Not only that, they look gorgeous on your dressing table too! The Jojoba company 100% natural Jojoba and Rosehip Oil is a multipurpose oil, perfect for hair and skin. The combination of ingredients is crucial to the benefits in that they help deliver the product to the deeper layers of your skin where it is really needed. By massaging 2-3 drops onto clean damp skin the product is absorbed and nourishes where needed. I loved using this before bed to really hydrate my skin as I’ve found with age I get dry around the chin area. I love to let this work it’s magic overnight for a really healthy glow and thoroughly moisturised skin in the morning. The bottle is stunning by the way – you won’t forget to put this on, because it’s a must have on your dressing table! Embryolisse is a French brand I’ve used before with their Radiant Eye Cooling Stick so I knew the quality would be good. I don’t normally use a CC cream, just foundation so thought this would be interesting to try out. The product has colour adapting technology and literally changes on your skin to suit your tone and colour. With SPF 20 included and high coverage I absolutely love this product and was amazed at how well it applied to my face. It covered all my blemishes, is moisturising, left my skin fresh, glowing and blurred away those fine lines – definitely a replacement for my current foundation. The Superfruit Complex 10 in 1 Multi-Benefit Hair Masque from Shea Moisture is a luxurious treat for your hair that leaves it ultra soft, shiny, nourished, strengthened and more. I found this easy to use in the shower by applying then letting the water run down my back while the hair masque worked it’s magic before rinsing off. As you put your fingers through to rinse, you can feel that your hair is so smooth and soft, it feels fabulous, like a real treat and worth doing once a week when you have a few minutes to prevent dry, ageing hair. No Bleeding Lips from Know Cosmetics is a secret lip liner, clear in colour that can be applied around the edge of lips before lipstick or gloss to prevent bleeding. I found this super soft and easy to apply, leaving me with a well defined lip line and lipstick that looked well applied. Definitely a staple for the make up bag! YOU home cleaning products are naturally powered using 100% plant based products. With products available for the kitchen, bathroom, windows and all purpose cleaner, there really is something to cover the whole house. I received the kitchen and bathroom cleaners to put to the test and I’m immediately drawn to the bottle. They come in large clear spray bottles, with the liquid inside being clear too. 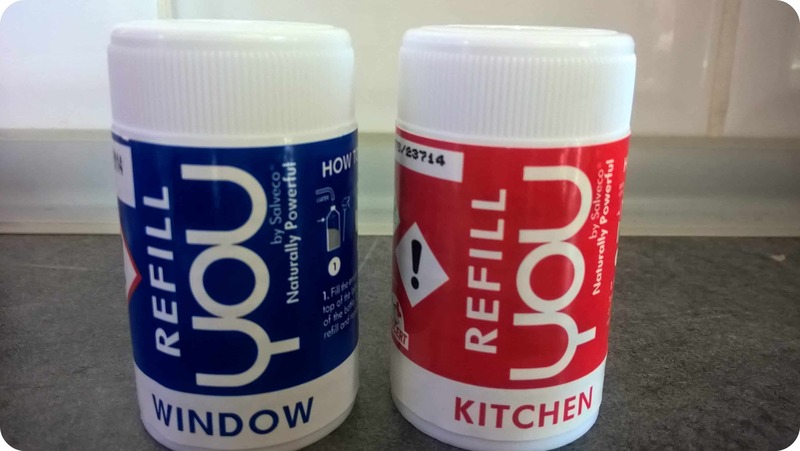 Each product has as different coloured label making them instantly recognisable. I really like the packaging and have to say it’s very eco friendly too. A unique concept with these products is that they are refillable which you don’t usually see with bottles of household cleaning fluids. 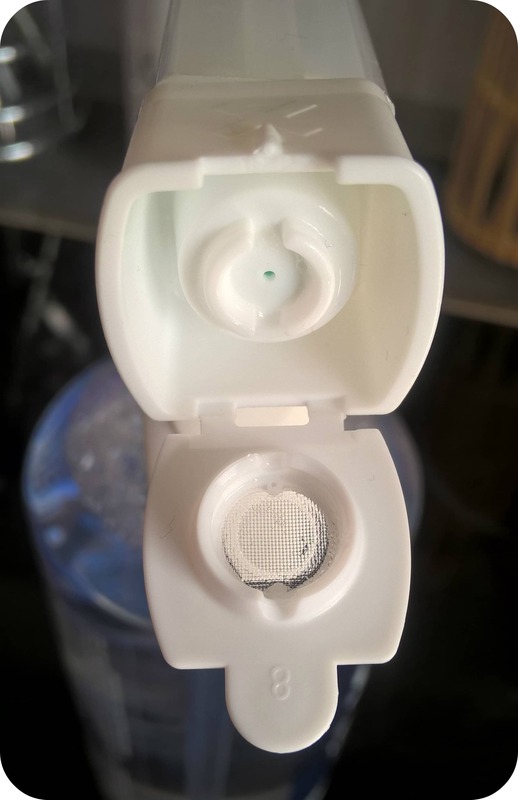 These rather cute refills are simply screwed onto the top of the bottles when empty along with water to create a whole new bottle of cleaning fluid. It’s estimated that the high quality trigger will last for at least 10,000 sprays, meaning you should be able to refill each bottle at least 10-15 times. The small size of the refills are ideal for storing at home and means less big bottles to bring home from the supermarket! I’m really impressed with the trigger on these bottles, you can see they are sturdy and well made. What I like is the lift up flap which when open allows for a standard spray to come out, and when the flap is closed it produces a foam, great when more product is needed for heavy duty cleaning. I’ve enjoyed using the YOU cleaning sprays. They are simple to use and I have found both to be effective. The kitchen spray really does work and is more powerful than I expected from a clear looking spray. I loved the foam action which worked well on my hob and the spray was great for round the sink and worktops. The window spray was also brilliant and comes with claims that it is smear free. I can assure that it most definitely is and one wipe of a cloth and it the window was left immediately shiny, not a hint of a smear. This is great and something that we get used regularly having young children and lots of sticky fingers touching the windows all the time! 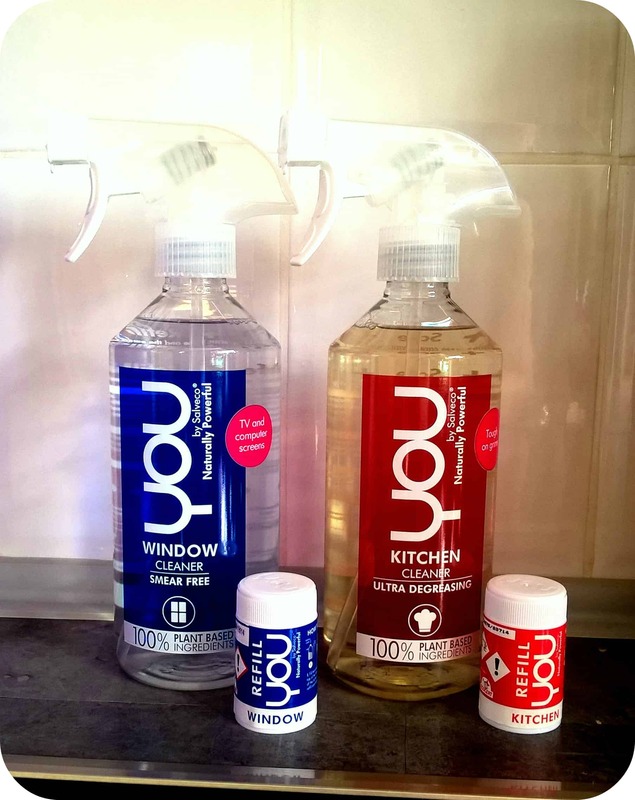 Overall I’ve loved using the YOU naturally powered products and they have been a great addition to to my cleaning cupboard. I’d definitely recommend giving them a try and don’t forget about those handy refills! All reviews are my own and my family’s opinions and we received some cleaning products in order to write the review.